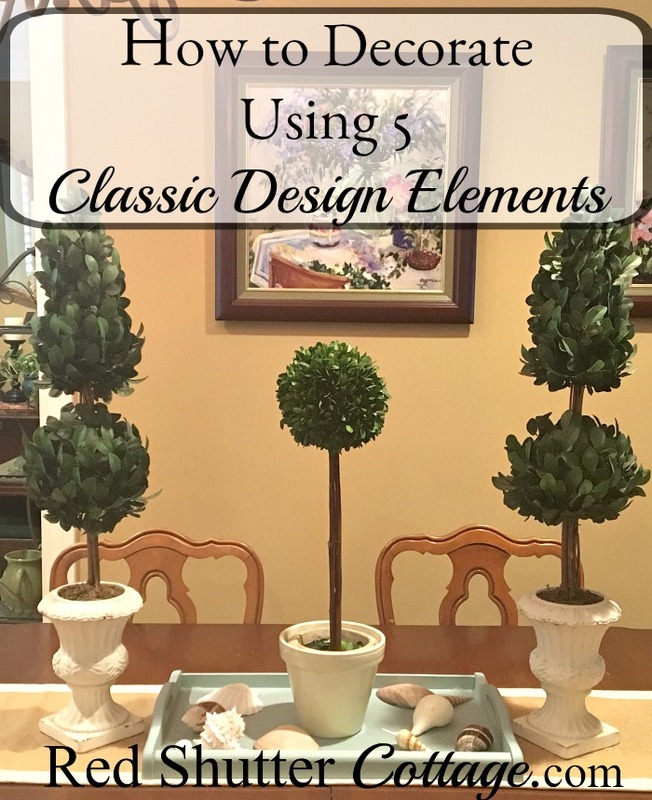 How to decorate using 5 classic design elements was an idea that came to me when I realized that all 5 of these elements have been around for many, many years, and I find myself using them over and over, all year round. 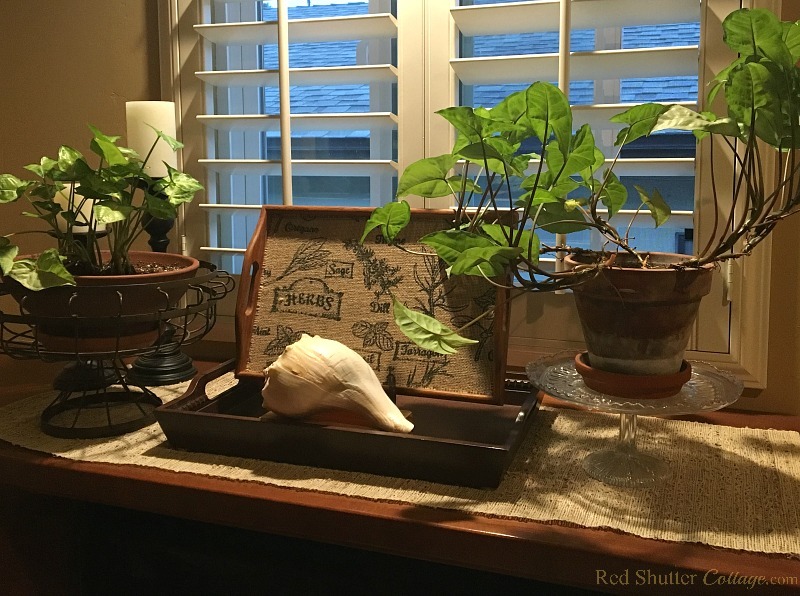 I wanted to share how I incorporate these timeless and classic items, on an everyday basis. They are not trendy, they are not specific to a certain design style, they are not even seasonal! 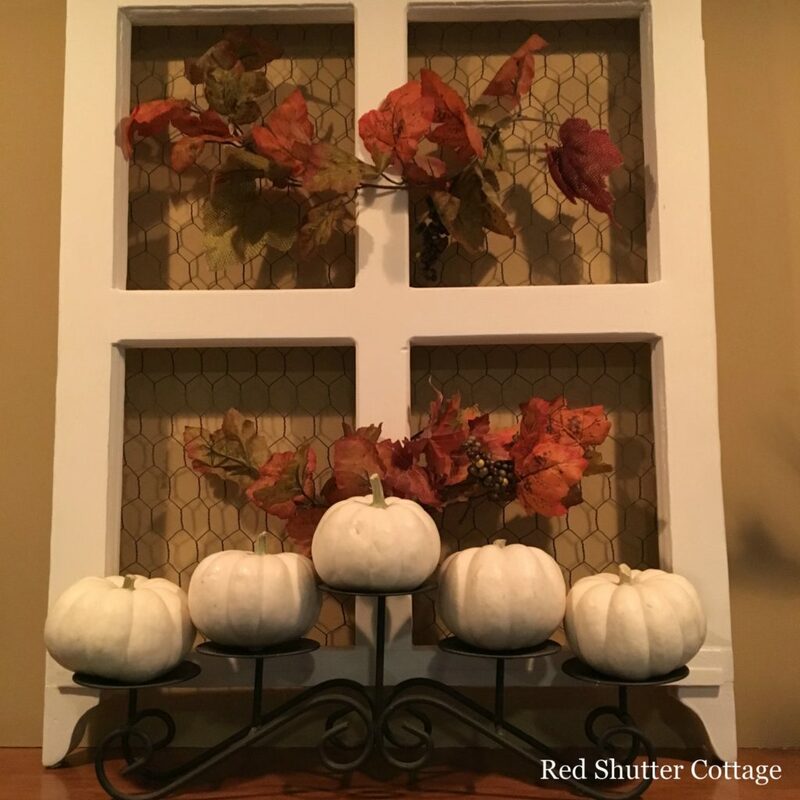 They are appropriate, decorative and pleasing to the eye in a variety of design styles, and at any time of the year. I will say this though; most of these classic elements work easily in these design environments: Traditional, Country, Cottage, Farmhouse, and Coastal. They may not work as well in a Mid-Century Modern, Contemporary, Victorian or Art Deco design environment. But as with every rule or guideline, there are always exceptions, and I have noted the instances where an element fits in with any environment. There is a wide range of options in this category: everything from live plants to silk plants, topiaries, arrangements, bare branches, branches with leaves. Adding in a bit of greenery, especially live greenery, brings a pop of life into the room. Live plants strategically placed bring the outdoors in. Topiaries in various shapes bring in color, as well as texture and architectural interest. They can be as simple as the classic ball in a terra cotta pot, or as elaborate as a double-ball English topiary with ivy strands reaching out this way and that. Live plants bring the outside in when added to a room. 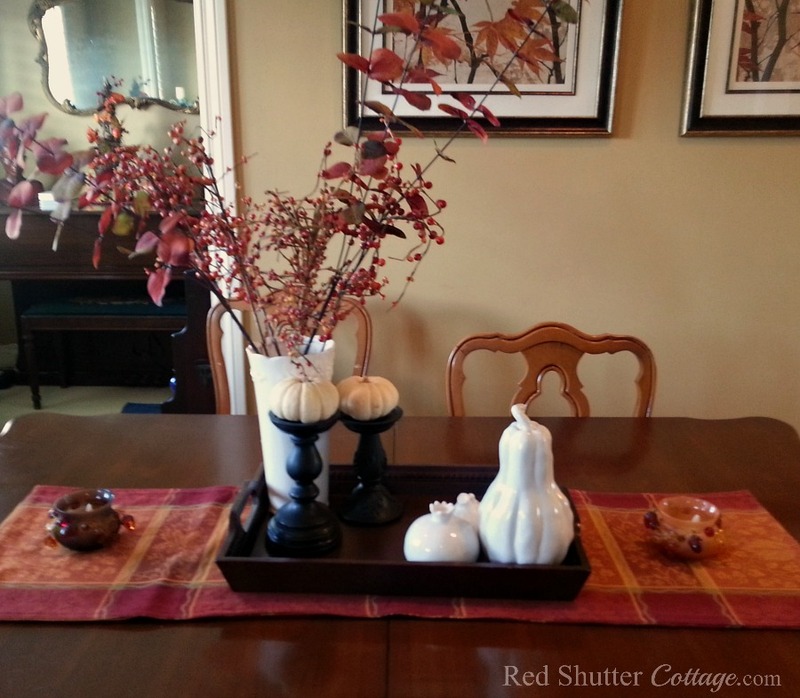 A vase filled with autumn-hued leaves contributes to a Fall theme. A galvanized metal pail filled with beautiful bare branches makes a lovely winter statement. A curvy white pitcher filled with eucaplyptus leaves is a bright touch for any time of the year. These are all ways to bring a sense of life and movement into a room. 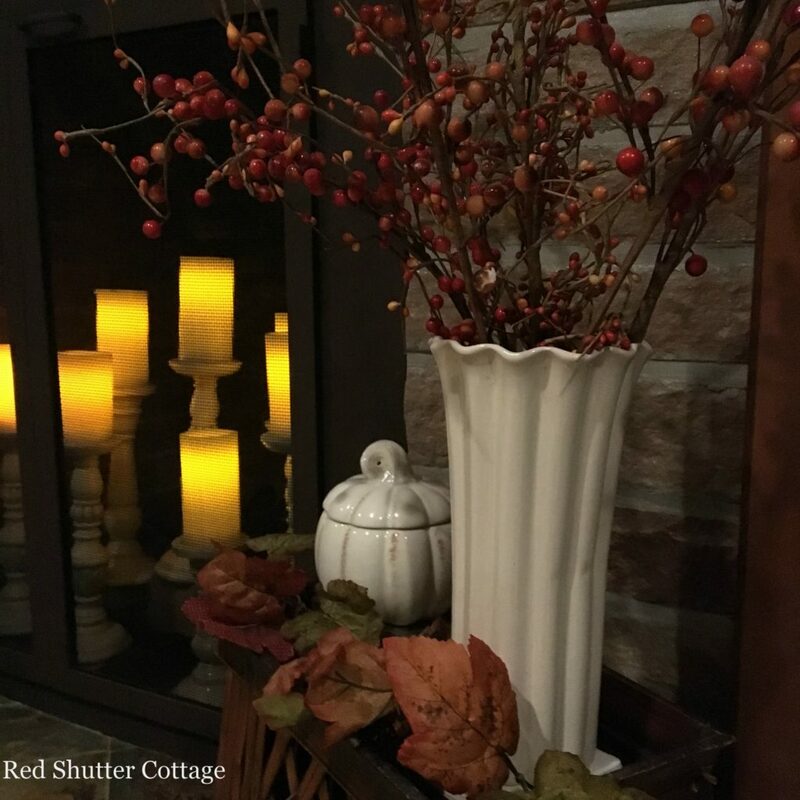 In this photo, a trio of dramatic branches with light-colored berries for greenery, and a lantern filled with both a candle and collection of mini-pine cones, wine corks and red berries. 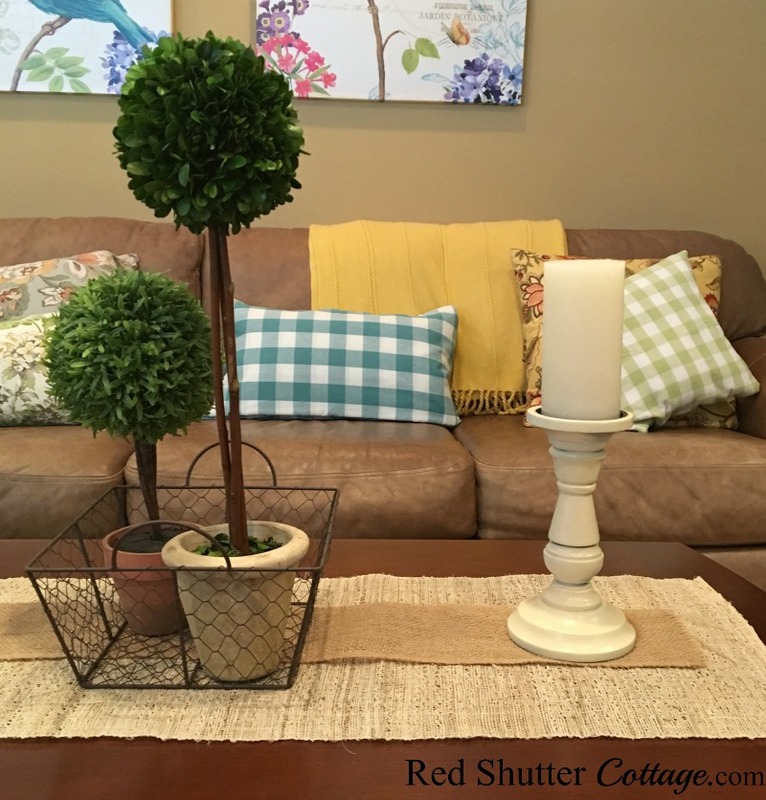 Topiaries bring texture and architectural interest to a room. I just smile and feel instantly at home whenever I see buffalo check. My favorite is black and white. But as you are well aware, buffalo comes in every color under the sun. It also comes in a wide variety of check sizes. I believe the classic, standard size is 1” checks, but I have seen patterns in checks as large as 4”. 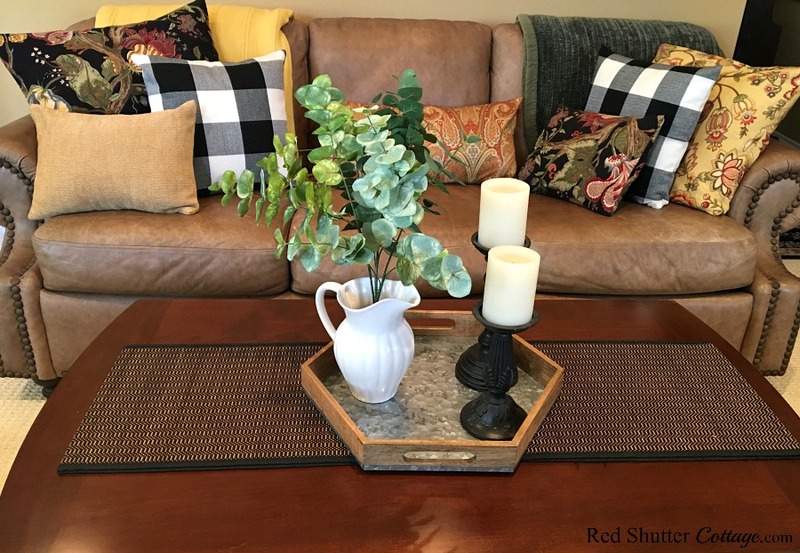 Buffalo check goes everywhere: curtains, table runner, dinner napkins, pillow covers, couches and chairs upholstered in buffalo check. It fits in anywhere with a little sense of ‘down-home’; unpretentious, all welcoming. A buffalo check in a larger, over the top sized check (5 or 6 inches square) can fit in with a more modern or contemporary design environment, especially if is a more neutral color; a soft taupe or washed-out gray. I am a bit of a traditionalist when it comes to buffalo check, and I came across what I thought was a black & white standard check size buffalo pillow cover on Amazon. I ordered two to use on my couch for winter. When I got them out of the package I was dismayed to see they were oversized, 4” checks. (They are pictured above.) I put one on a pillow, just in case, and thought I would try and live with it a day or two to see if I liked it. I almost sent it back, but Sailor voiced his opinion that he liked it. So, I kept it, and eventually, it did grow on me! 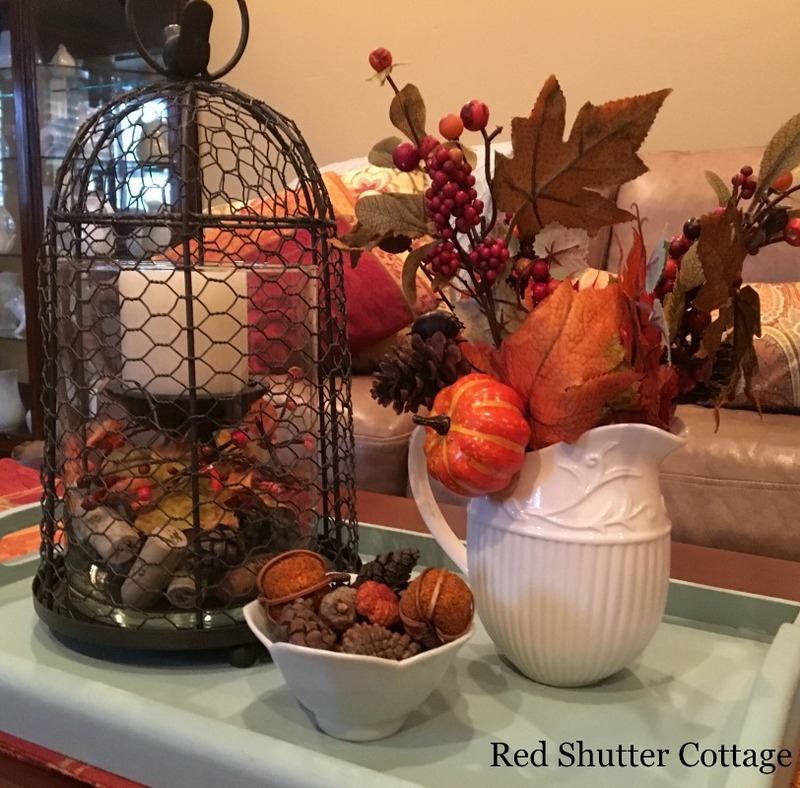 Please take a look at this very simple, beautiful fall table created by Paige over at Southern Curated. She put down a timeless black and white buffalo check runner and kept everything classic and natural, including the pears. It slays me every time! Where do I start with this one? Well, let’s see…. In what design environment does a botanical print NOT fit in? Answer: not a single one. Botanical prints fit in ANYWHERE. And I mean, everywhere and anywhere. These images are found at BelleMaisonArt on Etsy. Please see below for the link to the site. One reason is that they come in such a wide variety of colors, types, sizes, and detail. They are part science, part illustration, and part design. Another reason is they are timeless and convey a sort of old-world beauty. And a third reason is that they come in various forms and are offered in a variety of sizes. They are not expensive and can be purchased almost anywhere on the internet. These beautiful images above are found on BelleMaisonArt on Etsy. Additionally, several blogs offer them for free! Here are links to two of them: On Sutton Place and Blesser House. 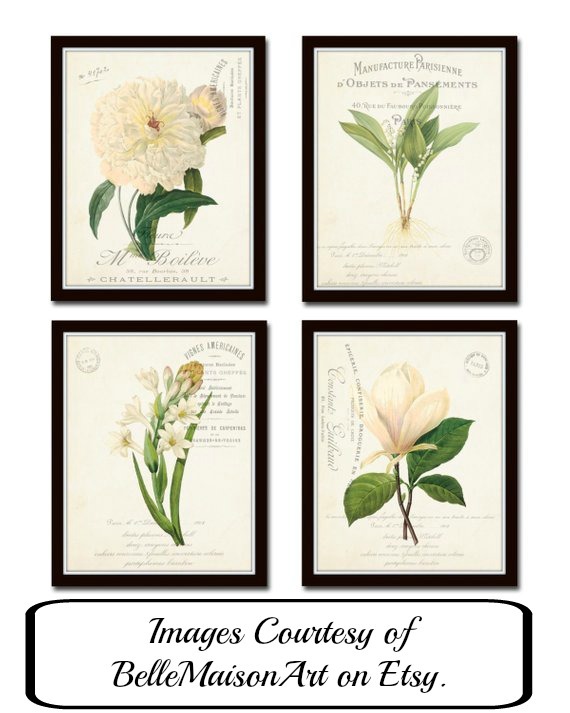 With their subtle, muted colors, and impossible-to-read yet beautiful scripts and fonts, botanical prints make a subtle statement of sophistication and elegance that is both accessible and welcoming. A little ivy (green), candleholder and a botanical print. Because candles make such an impact on a room (and by that, I mean lit candles), I want to include candle holders and lanterns. And with the new, more natural looking battery-operated candles coming out, candles are easily a must-have to help make a room warm and welcoming. A dozen candles on candleholders fill up our fireplace. Let’s start with candleholders. Because they come in such a wide variety of shapes, height, design color and finishes, here again is an element that can fit in any and all design environments. 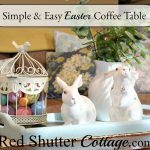 They can be positioned anywhere: coffee table, side table, dining table, mantel, hearth, bookcases, bakers rack, a table in the entryway. The list is almost endless. All battery operated candles have a timer option. That phrase “set it and forget it!” most definitely applies here. And if you are coming home after dark, late on a winter afternoon, how lovely to walk into your home filled with warm, flickering candles to welcome you! 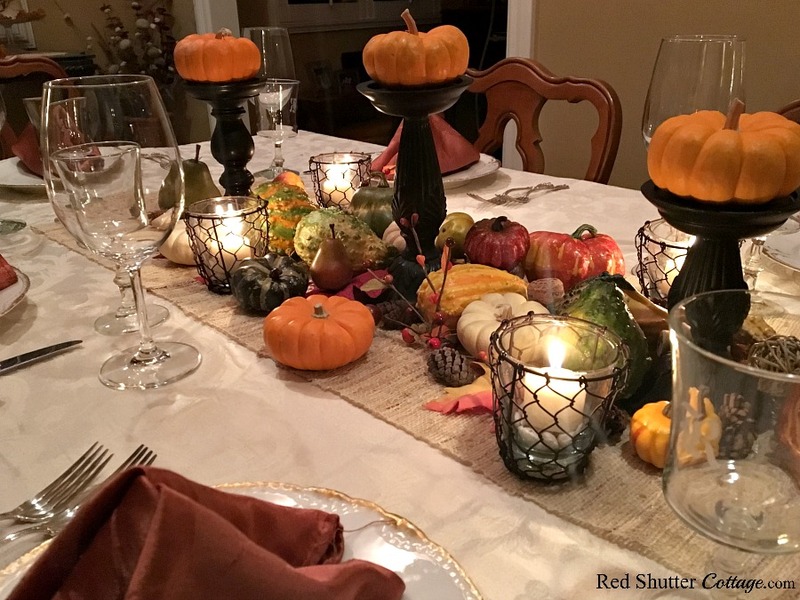 Here is an example of greenery (a spray of fall berries and leaves) and white pumpkins sitting atop candleholders. 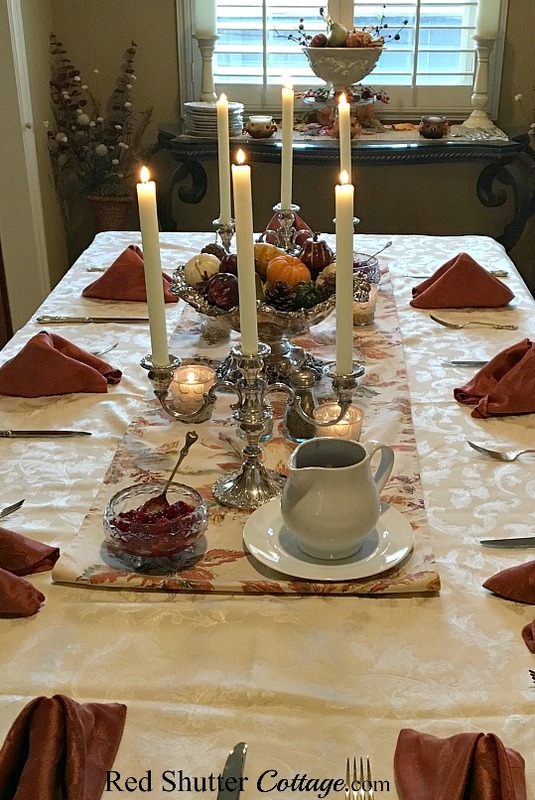 A multi-level candleholder sporting white pumpkins. Have I shown enough examples of a candleholder holding a pumpkin? If not, here’s another one! Lanterns are another vehicle to bring candlelight into a room is. And the best part is — they can be used together with candleholders in the same room, but serve 2 entirely different functions. Pretty much anywhere you can put a candleholder, you can also put a lantern. That is why it’s fun to have both and mix them in together. Candles on the mantel, lanterns on the hearth. Candles on the coffee table, lanterns on the side table. Candles on the dining table, lanterns on the sideboard or buffet. But consider this idea as well. You don’t need to necessarily place candles in a lantern. You can fill it with seasonal items; tiny pumpkins or acorns in the fall, shells in the summertime, petite ornaments at Christmas, miniature pine cones or wine corks – any time of the year. 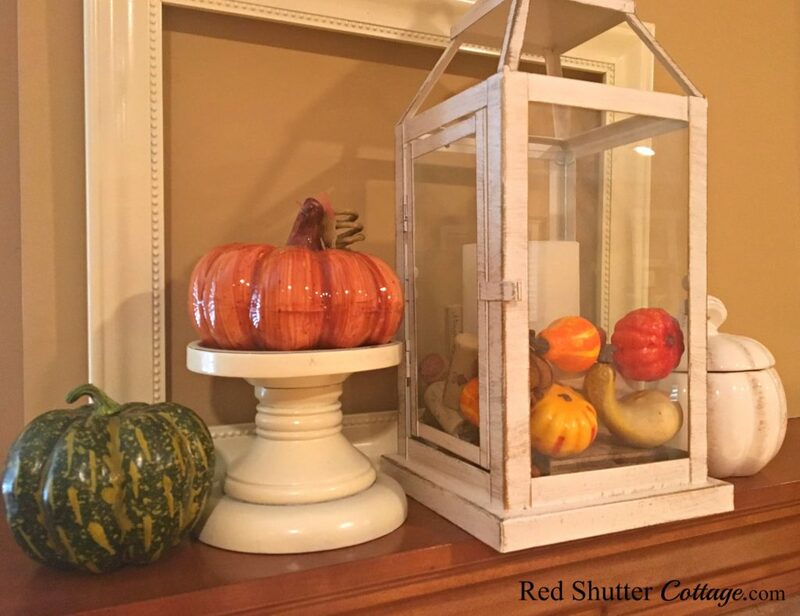 A mantel vignette incorporating a pumpkin on a candleholder, and a lantern filled with a candle and smaller gourds. Another option might be this: if your lantern is tall enough place a tall pillar candle inside, and then fill the bottom area around it with any of the above-listed items. 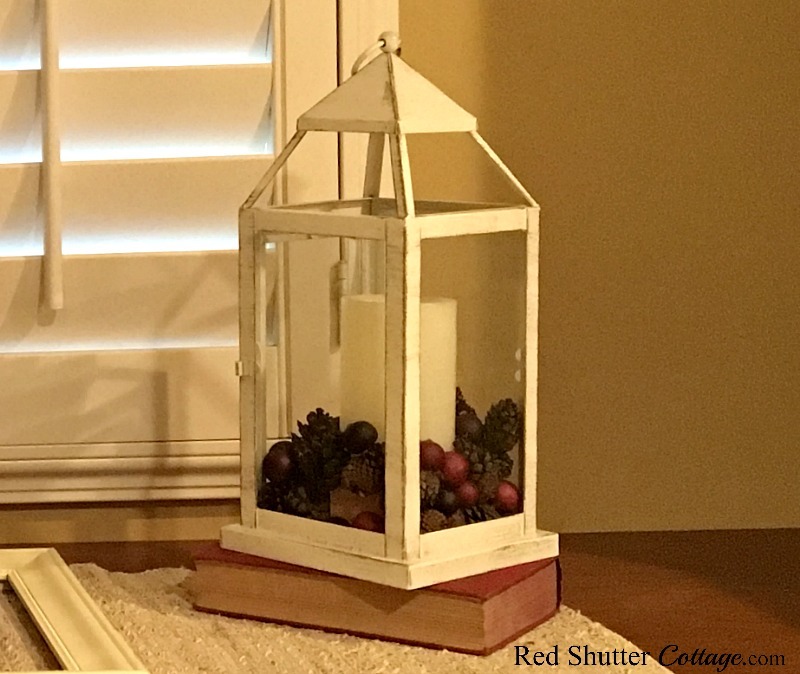 Here is an example of a simple lantern filled with a candle and pine cones, berries and wine corks. Lanterns are part of the 5 classic elements of design. 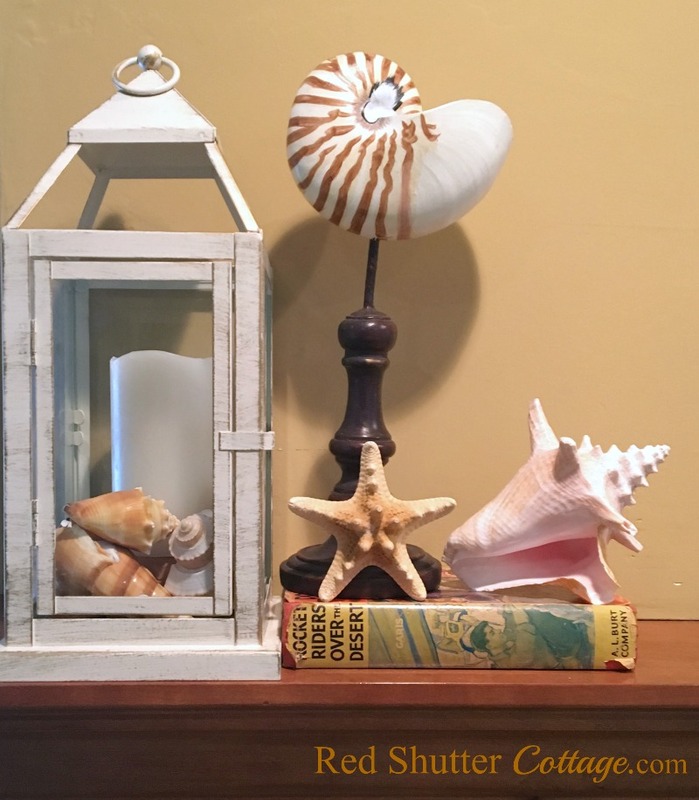 A simple lantern filled with a candle and shells. Or combine those items with a strand of fairy lights. Set the timer first, and then add in a few of your design items, add in more of the strand, layer in a few more design items, and then add the rest of the strand. Step back and admire a lovely addition to enhance the overall look of your room. Pitchers and platters and plates – Oh my! White ceramic ware brings simple warmth and brightness to any room, no matter how it is used. Let’s start with my favorite – white pitchers. Apparently, I have a slight obsession with them. I am not sure how that happened, but I am going to blame Marion at Miss Mustard Seed. She collects ironstone, which simply does not exist in California. And while I can’t get ironstone, I can get white pitchers! I find them everywhere, but Home Goods is hands down my best source. I use them everywhere and anywhere, year-round. 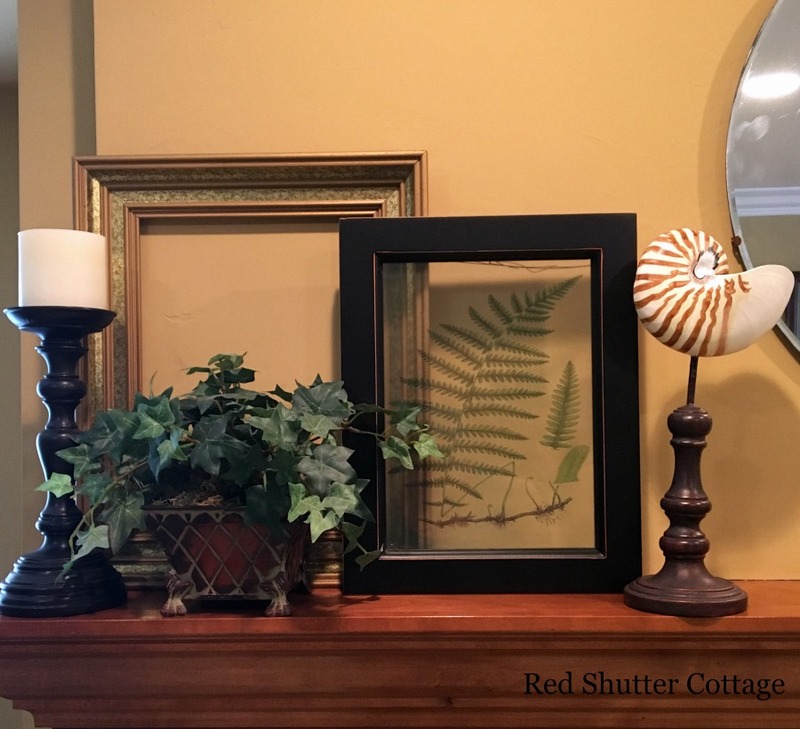 And if I am not using them as part of a vignette, or holding a scrubbing brush for dishes, showing off my hydrangeas, or serving the gravy at the Thanksgiving table, they are grouped together on my Grandmother’s display chest or in the glass display cabinet in the living room. They are, in short, useful, pretty, classic and timeless. Did I mention I seem to be obsessed with them? A small decorative white pitcher holding Harvest fruit and leaves. 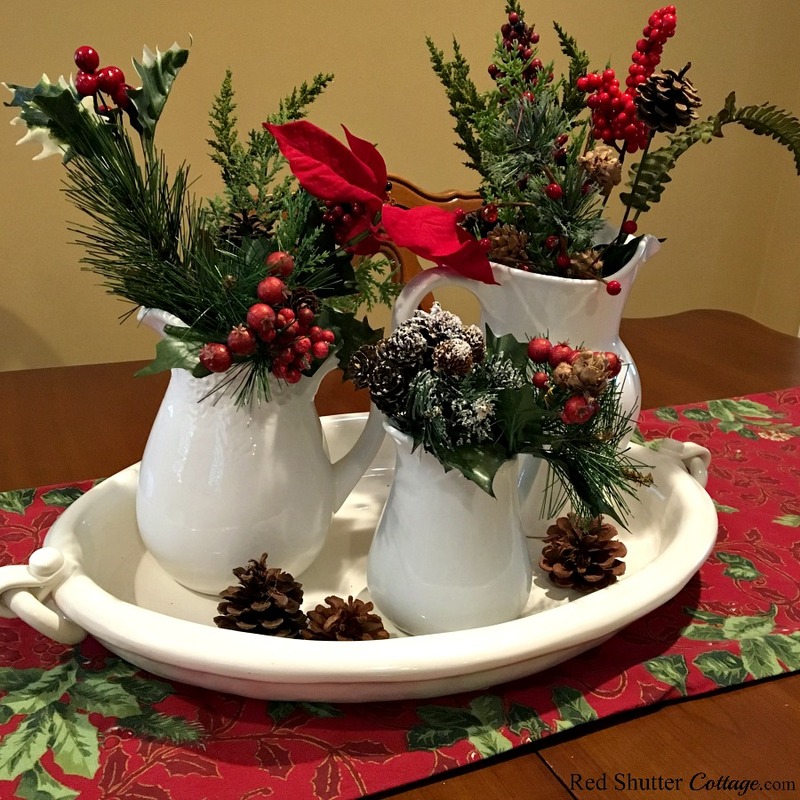 A white platter with white pitchers and a little Christmas greenery. A white pitcher holding the gravy for the Thanksgiving dinner. 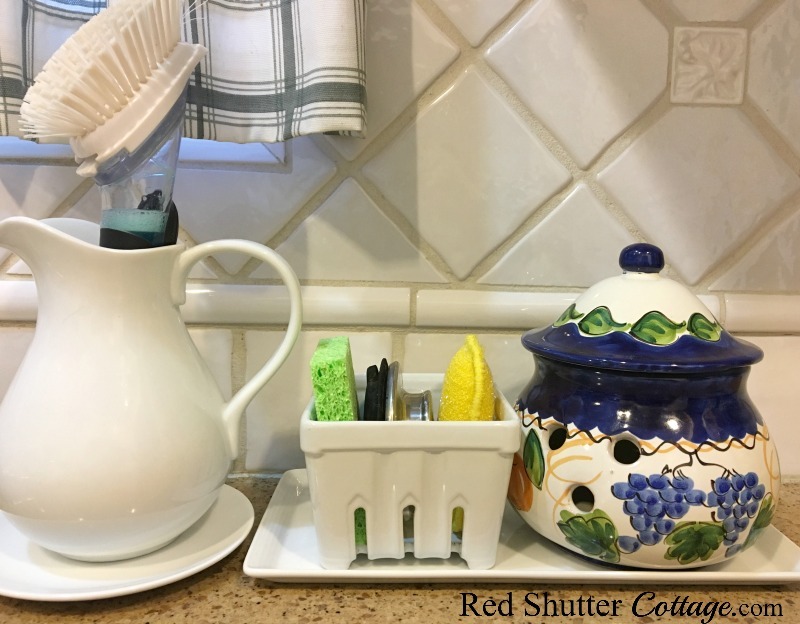 A white pitcher holding the dish scrub brush. Platters, plates and cups are legendary support players for accessorizing. Platters and plates are often hung on walls as a focus point, or combined with art or wreaths. A stack of plates sitting on top of a stack of books, topped off with a stack of teacups makes a charming, welcoming vignette. They can be used fill a kitchen hutch, or mixed in with books on a bookshelf. The variety and opportunities are almost endless. And they fit right in with all 4 of the other elements listed above. These 5 classic elements of design are all what I call ‘support players’. They act as background and enhancement for the major ‘movie stars’ in our décor. 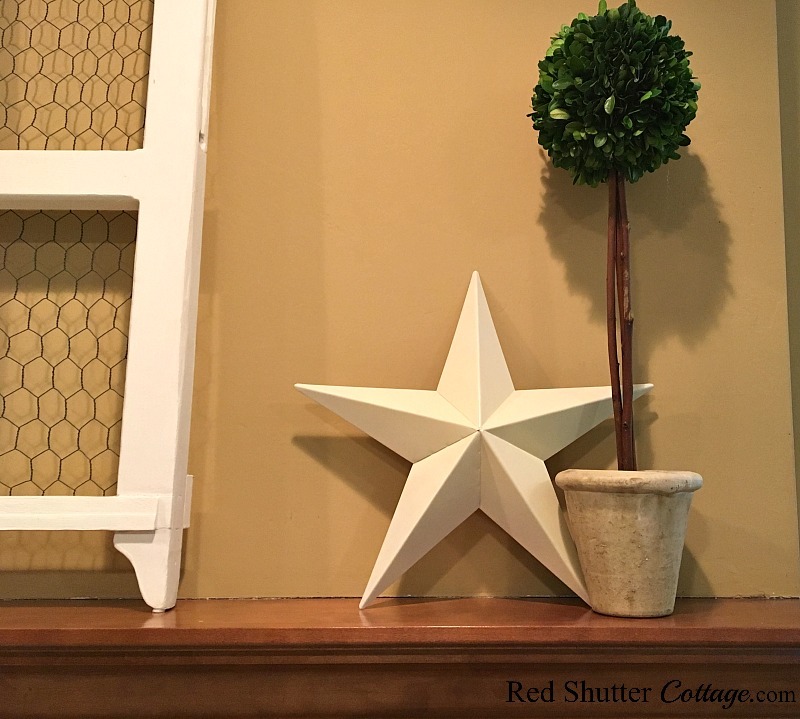 Your couch, chairs, coffee table, mantel, bookshelves, dining table – these are all the anchor pieces or ‘movie stars’. But without the support players, the movie stars look plain and a little lifeless. The support players come along and give personality, color and spirit to the movie stars. They add adornment, interest, depth and character. But you are really the most important player. You are the director, producer and screenwriter, all rolled into one. The support players (along with the movie stars) are all selected by you. And that is where your own personal sense of taste, style and flourish. And in a way it’s a responsibility. You are responsible for infusing your own style into how you use these classic elements or support players. It doesn’t matter if you choose to use one, three or none of these 5 elements. It only matters that your cast of characters (support players) are loyal to, and clearly reflect your sense of beauty, comfort and well-being in your home. It’s a theme I keep repeating here; train your eye (and your heart) about what really speaks to you. Shop garage sales, thrift stores, rummage sales so you are not investing heavily in your treasures. Collect coupons from stores you shop, and keep an eye out for their sales. Move pieces, elements, combinations, vignettes around. Shift, adjust, realign, keep rearranging until it looks right to both your eye and heart (again!). This is decorating school 101 and it’s (mostly!) free! These pictures are very beautiful. I liked these ideas to decorate using classic elements. Much appreciated for sharing this post. I’m so glad you found these ideas helpful! These elements are so flexible and can be used anywhere throughout your home. These are perfect design elements for casual styles. I’m with you when it comes to greenery and botanicals! 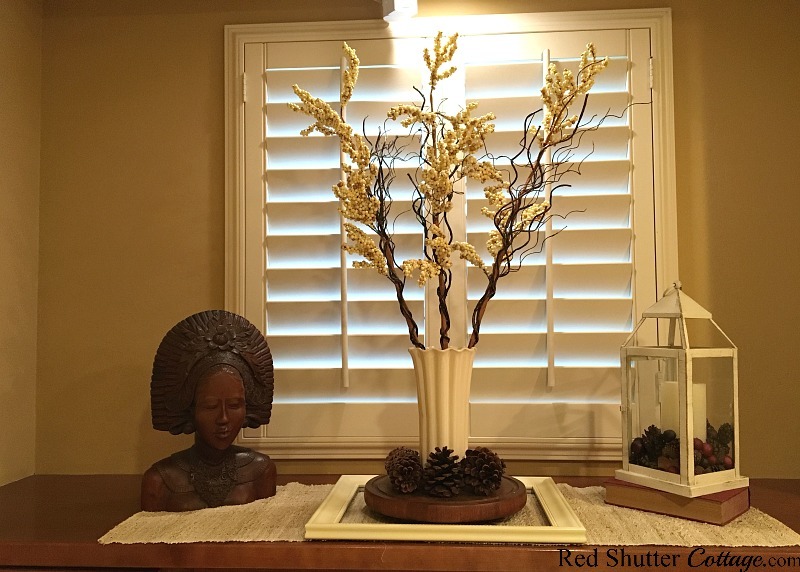 Candi – you’re so right – they both add a touch of nature that really can make a room more inviting! Thank you for stopping by! Timeless classic elements are classic for a reason. Nothing is more elegant than classic pieces. I want to use black and white buffalo check fabric for my Christmas decor this year and have not been able to get it in Canada. I still have time, and your cushions make me even more determined. Leanna- That’s what I like about these elements – they never look dated. I think that’s why I tend to shy away from trends – or maybe I am just too cautious! Thank you for stopping by!